During a nasty storm, a group of travelers find themselves at an old dilapidated mansion, home to the Femm family. Siblings Horace and Rebecca Femm live there with their scarred alcoholic butler, Morgan. The travelers soon get the idea that there are other people locked away somewhere in the house. Well, I’m kicking off a month full of scary movies with something that’s more of a comedy than a horror movie, but it has all the classic elements; a creepy family, stranded travelers, a horrendous storm and something in the attic. The movie is filled great dialogue and while I have never found it terribly frightening, it’s thick with atmosphere. The house is filled with menace, and wonderfully designed. 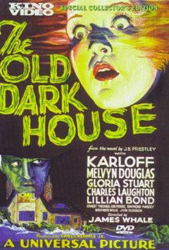 Boris Karloff is magnetic as the deranged drunken butler, but I really enjoyed Eva Moore’s performance as the sinister and hard-of-hearing, Rebecca Femm.